This essay by Chinese scholar Shen Dingli (of Fudan University in Shanghai, much hated on by rollback blogs like Joshua Stanton’s) argues that North Korea, even if an unwelcome nuclear power, remains a serious asset to Chinese security, holding down tens of thousands of American troops, keeping the pressure off of Taiwan, and keeping the Northeast border relatively stable (give or take a few thousand unarmed/partially clothed refugees). This kind of vigorous defense of the status quo doesn’t often hit the stands in English, but here it is. Probably the most interesting and extensive essay I’ve found thus far on LMD is this in-depth examination by Suki Kim of the soft-power extravaganza of the New York Philharmonic visit to Pyongyang. Recounting a party at U.S. Ambassador to China Clark Randt’s house prior to the voyage to Pyongyang, the article reminds us of how vested in the New York Phil trip (and thus a kind of American “sunshine policy”) the Bush administration had become by the twilight of its second term. 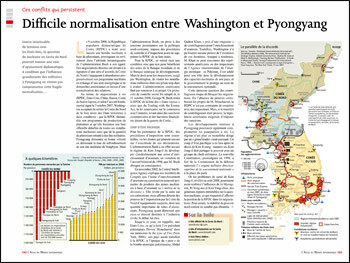 And sure, the article is a translation from the English of “A Really Big Show” which had been printed in Dec. 2008 in Harper’s, but I think this article is significant also from the standpoint of giving French audiences and intellectuals fodder for thought in the light of France’s ongoing diplomatic and cultural offensive toward the DPRK. As much as I respect — and I certainly respect — conservatives like Dana Rohrabacher for their work on North Korean human rights issues, the kind of anti-French vitriol that seems to have become de rigeur in certain political circles in the U.S. is wholly inappropriate when it comes to North Korean issues. French authors and journalists are doing excellent work on North Korea, and most of their stuff doesn’t make it into English, like this collection of short stories about five Korean women by the prize-winning author Eun Hee-Kyong. A noteable exception is Kang Chol-hwan’s iconic memoir, The Aquariums of Pyongyang, which began life as a French-language memoir that, though some miracle of publishing, made it into English and subsequently into the hands of President George W. Bush. I didn’t hear anyone complaining then about generous cultural subsidies in Paris or how French cultural arrogance. Kang’s was the first in what we can hope will be a long line of influential and useful French texts on North Korea that make their way into English (and Chinese, for that matter!). 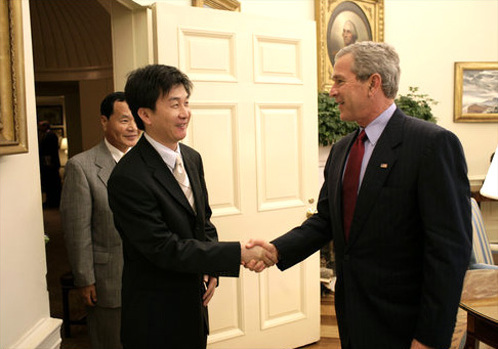 George W. Bush welcomes the author of the Francophone memoir, Les Aquariums du Pyongyang, to the Oval Office during the push to pass the North Korean Human Rights Act - viva le droit de l'homme! Speaking of translations, a good place to keep tabs on for upcoming publications and themes around global reception of Chinese culture more broadly arrives in the form of the University of Provence Extrem-Orient/Far East squad in southern France. And the journal Perspectives Chinois drills down into the Tibet issue with much success, via the Centre d’Études Français sur la Chine contemporaine [French Center for Research of Contemporary China/法国现代中国研究中心], including a review of a giant and important tome I have been slowly reading for the last four months, Melvyn Goldstein’s A History of Modern Tibet, Vol. II. Le Monde Diplo runs a few blogs which facilitate shorter essays like “Apocalyse, Year Zero?” about nuclear arms control. Finally, Pascalle Nivelle reports on Le Monde’s China blog on gangsters that seem to have taken over a Macau-style casino being built on the Laos-PRC frontier with overseas labor, including North Korean workers.